New apparatuses with which to see and understand the world differently than did the Ancients. The connection to Barad becomes even more apparent below when Vico calls "critique" an instrument. Another instrument that Vico uses/alludes to is the act of classification ("set up a distinction," "the orderly reduction of systematic rules"). Evokes complexity of creating classifications and boundary objects that can provide relational data, e.g., report of fire and report of car bombing.
. Previously, scholars have generally ignored any notion of time. Now, we need to make explicit our use of time in understanding disaster. Such an application, I believe, will give us a much deeper understanding on defining disaster, how and why such events unfold, and how various social entities attempt to return to normal after the event. Finally, the use of social time in disaster can provide sociologists a deeper look into understanding key theoretical issues related to social order, social change and social emergence, along with voluntaristic versus deterministic patterns of behavior among various units of analysis. Scarcity of temporal considerations in previous work. Connects sociotemporal experiences and enactment of time to social order, social change, volunteer behavior and new units of analysis. the field. Such a fresh approach possibly improves a wide range of conceptual issues in disasters and hazards. In addition, such an approach would give us insights on how disaster managers, emergency responders, and disaster victims (recognizing that these “roles” may overlap in some cases) see, use and experience time. This, in turn, could assist with a number of applied issues (e.g., warning, effective “response,” priorities in “recovery”) throughout the process of disaster. Neal cites his 1997 paper about the need to develop better categories to describe disaster phases. Here, her attempts to work through those classifications with a sociotemporal bent. Evokes Bowker and Star's work on classification and boundary objects/infrastructures but also Yakura (2002) on temporal boundary objects. The use of disaster periods provides a useful heuristic device for disaster researchers and disaster managers. These various approaches of disaster Phases give researchers an important means to develop research, organize dates, and generate research findings. Similarly, the use of disaster phases benefits disaster managers in attempting to improve their capabilities. Yet, the current use of disaster phases creates broad definitional problems of the field. I show that the current attempts to describe disaster phases are good heuristic devices, but not effective scientific concepts. Yet, scientific, empirical, and theoretical conclusions are drawn from the use of these Phases. 2) "more systematic, scientific approach to describe disaster phases"
The next logical step to aid analysis would be to cross-tabulate the temporal periods of "before, during, and after" with functional activities. This type of analysis and consideration could be further extended by including both the unit of analysis and various social categories such as social class or ethnicity. This type of three-dimensional approach would also strongly highlight the idea that disaster phases are multilayered. Overall, not only do different groups and units of analysis experience the phases at different times, but that multiple aspects of time (i.e., objective and subjective; before, during, after a disaster) intermesh with specific activities. Evokes temporal boundary objects and classification alongside feminist and post-colonial HCI approaches. Neal argues that individuals and groups, and subunits of each, may experience phases at different times. Disaster Phases Are Mutually Inclusive As previously indicated, disaster phases overlap. From a theoretical and applied viewpoint, researchers and practitioners must first recognize that disaster phases are not discrete units. Neal argues that disaster phases are interconnected and influence what happens (or does not happen) in other phases. Second, the manner the field handles the issue of disaster phases actually reflects a larger problem in the field. Specifically, how do we define disaster? Kreps (1984, p. 324) comes closest to recognizing the relationship among disaster phases, the theoretical components of disaster (i.e., social order and social action), and the definition of disaster (primarily in a heading in his paper). Unfortunately, he does not elaborate upon the connection of defining disaster and disaster phases. Thus, recognizing and recasting our notion of disaster phases may actually help the field more precisely understand or define "disaster." Has this changed since 1997? Cites a passage from Quarantelli that argues disaster research is not well defined. Evokes Bowker and Star's boundary objects work. Researchers have at times treated the disaster phases as scientific constructs to order data and for scientific analysis. However, as the organizational and family literature show, assumptions based on life-cycle approaches and assumptions often fall outside the realm of appropriate scientific analysis. Here, the phases within the disaster life cycle fall outside the scientific necessity of well-de­fined, mutually exclusive concepts. Critique of scientific methods/needs for classification leading practitioner work astray. Good analogy with family life cycles. One high-level manager involved with the Federal Response Plan made the following reflection about two weeks after Hurricane Andrew occurred: My feeling is that recovery needs to start day one, or even prior to a disaster. It would be wise to set up a group or task force, or a committee. They get together to gather information as the disaster begins. The potential for fragmentation is enormous. It actually goes back to intelligence, damage information. It is difficult to plan for recovery when you do 001 have a sense for how long it could take. You know, recovery has already begun. FEMA has already issued over one million dollars worth of checks .... Anyway, why not have a recovery unit? That would be cool. They should deal the long term recovery within hazard mitigation. In any event that needs to be happening ftom day one. Interesting. This pretty much describes the SBTF mission, per the intelligence gathering. Need to research whether these issues have been resolved or workarounds put in place since this 1997 publication. I kind of suspect not. Of equal importance, both structural-and non­structural-mitigation techniques would lessen dramatically response needs. In essence, effective mitigation and preparation would lessen response time. Logically extended, effective mitigation and preparation when coupled with an effective response could decrease the time for both short-and long-tenn recovery. Tlus analysis further convinced me of the interconnec­tiveness of the disaster periods. Another anecdote about de-coupling phase classifications from temporality in order to better describe what is happening. Need some sort of sliding scale. Therefore, if disaster researchers wish to improve the theoretical devel­opment of the field dramatically, I argue that we should reanalyze the current heuristic related to the phases. Is Neal still making this argument? Describes the phases as not linear, and more cyclical. Phases may vary temporally, may overlap, differ in pace, and/or never come to a periodic conclusion depending on the pre-disaster built environment. Critique of incomplete temporal models for disaster research. Since the beginning of the field, disaster researchers have observed various types of disaster periods. Specifically, different events seem to occur at different times related to a disaster. Also, both academics and practitioners assume that these phases exist, and act as if they do exist Yet, in the last 30 years or so, disaster researchers or practitioners have accom­plished little in defining or refining the use of disaster phases. Yet, as I show in the next two sections, both researchers and practitioners have questioned the use of disaster phases since their initial use. Is this criticism still true? Other empirical studies show that the recovery process is not a simple, linear, or cyclical process. Different units or groups may experience, or perceive that they experience, the different stages of recovery I) at different times and 2) at different rates of time. Neal cites several studies that contend the recovery process is temporally complex. Overall, recovery studies suggest that subcategories of the recovery process exist. However, different units of analysis (e.g., individual versus group) or different types of groups (e.g., based on ethnicity or social class) may experience the phases of recovery at differing rates. Thus, patterns, phrases or cycles of recovery are not linear. Strong statement on how the unit of analysis can influence disaster research beyond theoretical frameworks and the need to look at temporality differently. The edited work by Haas, Kates, and Bowden ( 1977) illustrates the complexity of the recovery process. Unlike most other overall codification efforts, the above authors explicitly recog­nize that recovery reflects a complex process. They note that people use several subcategories (e.g., restoration, recovery, rehabilitation, redevelop­ment, reconstruction) to describe aspects of the recovery period. This classification of the recovery phase by Haas, Kates, and Bowden inclues more description of the phases but still cast it as a linear timeline. In Drabek's (1986) more recent codification effort, he modifies the disaster phases. His revision reflects the language of the National Governor's Association's 1979 recommendations (i.e., preparedness, response, recovery, mitigation) of disaster phases. Some of Drabek's updates include temporal markers (pre- and post-impact, periods of time, etc.) Neal continues to criticize the lack of definition and theory driving the evolution of classification. The current NGA homeland security classifications are: Prepare, Prevent, Respond, Recover. Early work to codify natural disasters relied in different degrees on the temporality of the event as a timeline of before/during/after. Neal critiques this work as lacking in theoretical implications. He adds that this phase could be important with sudden impacts, but not as important with slow-moving impacts. Barton's definition of disaster phases (1970) includes event temporality: slow-moving vs sudden. Dyne's definition evokes Powell's timeline approach to all disaster phases. Mileti, Drabek, and Haas developed their six categories of: 1) preparedness/adjust­ment; 2) warning; 3) pre-impact, early actions; 4) post-impact, short-term actions; 5) relief or restoration, and 6) reconstruction. They justify these categories by noting that "Numerous researchers have documented how activities and nonnative definitions appear to vary across time and vary greatly among events" (Mileti, Drabek, Haas 1975, p. 9). The six phases serve as a central component of the authors' codification effort (it organizes the book chapters). Yet, the authors do not provide a more specific defini­tion for each category. Other theoretical underpinnings in the book receive much more detailed justification (e.g., collective stress, social nature of disaster). An update to Barton and Dyne's work by Mileti, Drabek and Haas continues to give short-shrift to theoretical underpinnings of the classifications, per Neal. Evokes Bowker and Star's work on classifications. It is boundaries that help us separate one entity from another: "To classify things is to arrange them in groups ... separated by clearly determined lines of demarcation .... At the bottom of our conception of class there is the idea of a circumscription with fixed and definite outlines. "7 Indeed, the word define derives from the Latin word for boundary, which is finis. To define something is to mark its boundaries, 8 to surround it with a mental fence that sepa­rates it from everything else. As evidenced by our failure to notice objects that are not clearly differentiated from their surroundings, it is their boundaries that allow us to perceive "things" at all. Social reality is constructed by defining boundaries and visibility to objects. Evokes Bowker and Star's classification and boundary object framework. In order to endow the things we perceive with meaning, we normally ignore their uniqueness and regard them as typical mem­bers of a particular class of objects (a relative, a present), acts (an apology, a crime), or events (a game, a conference).2 After all, "If each of the many things in the world were taken as distinct, unique, a thing in itself unrelated to any other thing, perception of the world would disintegrate into complete meaninglessness. "3 Indeed, things become meaningful only when placed in some category. Connect this to Bowker and Star (2000) Sorting Things Out. Resistance Realily is 'that which resists,' according to Latour's (1987) Pragmatist­inspired definition. The resistances thal designers and users encounter will change lhc ubiquitous networks of classifications and standards. Although convergence may appear at times to create an inescapable cycle of feedback and verification, the very multiplicity of people, things and processes involved mean lhat they are never locked in for all time. Questioning the infrastructural inversion via ubiquity, material and texture, history, and power shapes the visibility and invisibility of the infrastructure that society creates for itself. Infrastructure and Method: Convergence These ubiquitous, textured dai;sifications and standards help frame our representation of the past and the sequencing of event� in the present. They (:an best be understood as doing the ever local, ever partial work of making it appear that science describes nature (and nature alone) and that politics is about social power (and social power alone). Convergence gets to how things work out as "scaffolding in the conduct of modern life." Practical Politics �1 ·he fourch major theme is uncovering the practical politics of classifying awl standardizing. 'fhi<; is the de.sign end of the spectrum of investigat­ing categories and standards as technologies. There are two processes associated with these politics: arriving at categories and standards, and, along the way, deciding what will be visible or invisible within the system. Politics, as in power dynamics, leadership, negotiation, and decision-making authority, play a role in determining how classifications and standards infrastructures are perceived as visible/invisible. Materiality and Texture The second methodological departure point is that. classifications and standards are material, as well as symbolic. Another way to make infrastructures visible is to envision their physical presence (materiality) and texture (experience). Metaphors play an important role here. This chapter offers four themes, methodological points of departure for the analysis of these complex relationships. Each theme operates as a gestalt switch-it comes in the form of an i11fras/:ruclural inversion (Bowker 1994). This inversion is a struggle against the tendency of infrastructure to disappear (except when breaking down). Tt means learning to look closely at technologies and arrangements that, by design and hy habit, tend to fade into the woodwork (sometimes literally!). 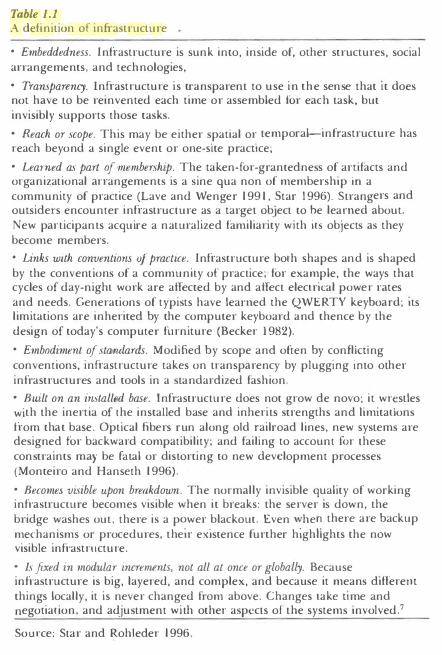 Infrastructural inversion means recognizing the depths of interde­pendence of technical networks and standards, on the one hand, and the real work of politics and knowledge production8 on the other. A negotiated order in which all of the above, recursively, can function together. The sheer density of the collisions of classification schemes in our lives calls for a new kind of science, a new set of metaphors, linking tradi­tional social science and computer and information science. We need a tqpography of things such as the distribution of ambiguity; the fluid dynamics of how classification systems meet up-a plate tectonics rather than a static geology. This nevi science will draw on the best empirical studies of work-arounds, information use, and mundane tools such as desktop folders and file cabinets (perhaps peering back­wards out frorn the Web and into the practices). It will also use the best of object-oriented programming and other areas of computer science to describe this territory. It will build on years of valuable research on classification in library and information s<:ience. 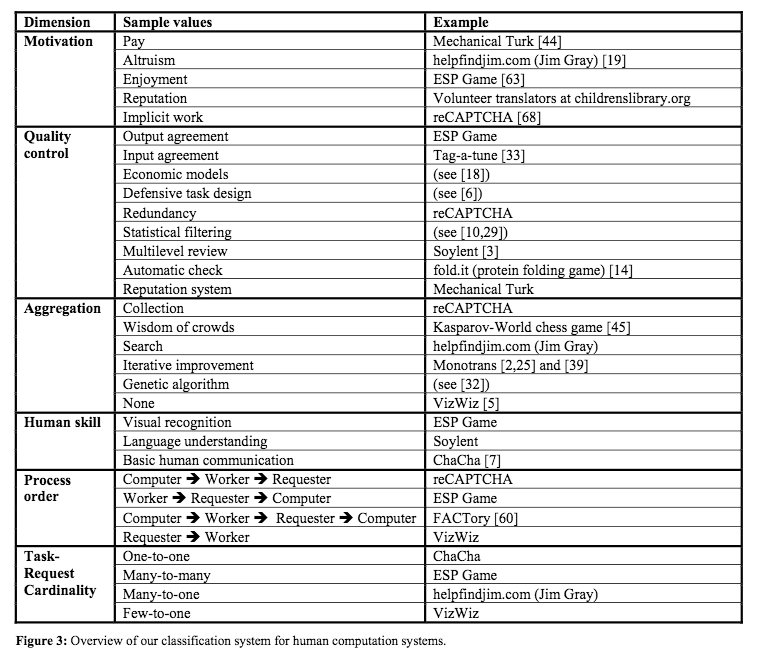 "Why it is important to study classification systems"
Information infrastrucLUre is a tricky thing to analyze_l; Good, usable systems disappear almost by deiinition. The easier they arc lo use, the harder they are to see. Forms like Lhe death certificate, ·when ag6TTcgated, form a case of what Kirk and Kutd1ins (1992) call "the substitution of precision for validity" (see also Star 1989b). That is, when a seemingly neutral data collection mechanism is substituted for ethkal conflict about the con­tents of the forms, the moral debate is partially erased. One may get ever more prn:ise knowledge, without having resolved deeper ques­tions, and indeed, by burying those questions. Real dilemma for humanitarian data: "the substitution of precision for validity"
Nomenclature and dassifi<:at..ion are frequently confused, howevc1; since attempts are often made to model nomencla­ture on a 1>ingle, stable system of classification principles, as for exam­ple with bot.any (Bowke1; in press) or anatomy. Nomenclature is an "agreed-upon naming scheme, one that does not follow any classificatory principles." "A classification system exhibits the following properties:"
vVe have a moral and ethical agenda in our querying of these systems. Each standard and each category valorizcs some point of view and silences another. This is not inherently a bad thing-indeed it is inescapable. Key point here about the power of classification to make objects/phenomena visible or invisible. In thinking about classifications of time/temporality, what does the standardization of some forms (ISO, commonly accepted terms/metaphors) say about the systems we design to account for time-based information? Is it simply an argument of ease/difficulty in formatting temporal data or is there some other social/cultural issue at play? Ubiquity __ The first major theme is the ubiquity of classifying and standardmng. Classification schemes and standards literally saturate our environ­ment. This chapter offers four themes, methodological points of departure for the analysis of these complex relationships. Each theme operates as a gestalt switch-it comes in the form of an infrastructural inversion (Bowker 1994). This inversion is a struggle against the tendency of infrastructure to disappear (except when breaking down). It means learning to look closely at technologies and arrangements that, by design and by habit, tend to fade into the woodwork (sometimes literally!). Infrastructural inversion means recognizing the depths of interde­pendence of technical networks and standards, on the one hand, and the real work of politics and knowledge production8 on the other. • A historical process of development of many tools, arranged for a wide variety of users and made to work in concert • A practical match among routines of work practice, technology, and wider scale organizational and technical resources • A rich set of negotiated compromises ranging from epistemology to data entry that are both available and transparent to communities of users • A negotiated order in which all of the above, recursively, can function together. Information infrastructure is a tricky thing to analyze.6 Good, usable systems disappear almost by definition. The easier they are to use, the harder they are to see. As well, most of the time, the bigger they are, the harder they are to see. The sheer density of the collisions of classification scheme� in_ our liv�s calls for a new kind of science, a new set of metaphors, hnkmg tradi­tional social science and computer and information scien�e. We ne�d a topography of things such as the distribution of ambiguity; the flu_,d dynamics of how classification systems �eet u�-a plate tectomcs rather than a static geology. This new science will draw on the best empirical studies of work-arounds, info�mation use, and �undan_e tools such as desktop folders and file cabmets (perhaps peering back­wards out from the Web and into the practices). It will also use th<: best of object-oriented programming and other areas of compute, science to describe this territory. It will build on years of valuablt research on classification in library and information science. Forms like the death certificate, when aggregated, form a case of what Kirk and Kutch ins ( 1992) call "the substitution of precision for validity" (see also Star 1989b). That is, when a seemingly neutral data collection mechanism is substituted for ethical conflict about the con­tents of the forms, the moral debate is partially erased. One may get ever more precise knowledge, without having resolved deeper ques­tions, and indeed, by burying those questions. Standards Classifications and standards are closely related, but not identical. While this book focuses on classification, standards are crucial compo­nents of the larger argument. The systems we discuss often do become standardized; in addition, a standard is in part a way of classifying the world. Classification A classification is a spatial, temporal, or spatio-temporal segmentation of the world. A "classification system" is a set of boxes (metaphorical or literal) into which things can be put to then do some kind of work-bureau­cratic 9r knowledge production. We have a moral and ethical agenda in our querying of these systems. Each standard and each category valorizes some point of view and silences another. Geertz critique of the behaviorist fallacy also seems to touch on Bowker and Star's argument that meaningful classification comes from within a group not an external observer. Analysis, then, is sorting out the structures of signification-what Ryle called established codes, a somewhat misleading expression, for it makes the enterprise sound too much like that of the cipher clerk when it is much more like that of the literary critic-and determining their social ground and import. "sorting out the structures of signification ... and determining their social ground and import" seems akin to Bowker and Star's discussion about the social, ethical, and moral aspects of classification. In order to endow the things we perceive with meaning, we normally ignore their uniqueness and regard them as typical mem-bers of a particular class of objects (a relative, a present), acts (an apology, a crime), or events (a game, a conference). Connect this to HCC reading: Bowker and Star (2000) Sorting Things Out. Here Borgman suggest that there is some confusion or lack of overlap between the words that humanist and social scientists use in distinguishing types of information from the language used to describe data. Humanist and social scientists frequently distinguish between primary and secondary information based on the degree of analysis. Yet this ordering sometimes conflates data sources, and resorces, as exemplified by a report that distinguishes quote primary resources, ed books quote from quote secondary resources, Ed catalogs quote. Resorts is also categorized as primary wear sensor data AMA numerical data and filled notebooks, all of which would be considered data in The Sciences. But rarely would book cover conference proceedings, and he sees that the report categorizes as primary resources be considered data, except when used for text or data mining purposes. Catalogs, subject indices, citation index is, search engines, and web portals were classified as secondary resources.